We drove out of Berlin after five nights, still not sure we shouldn’t have stayed longer, but also itching to move on. Our plan was to head to Austria via the Czech Republic before meeting friends in the Black Forest, so again, south we headed. The first stage of our “Post Berlin Period” was Saxony, we didn’t get long but what we saw we really liked. We’d managed a nice long run from Berlin and got right down to the top of Saxony to a good little campsite with a lovely swimming lake. 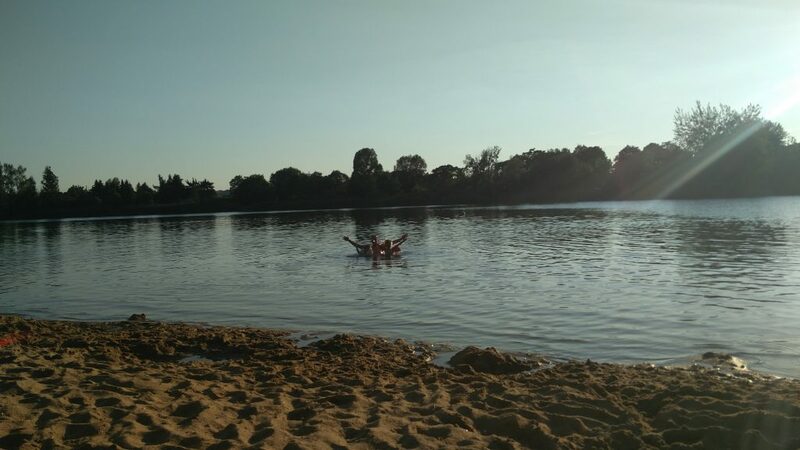 Turning up at a campsite and finding it has a beautiful swimming lake is a proper bonus! 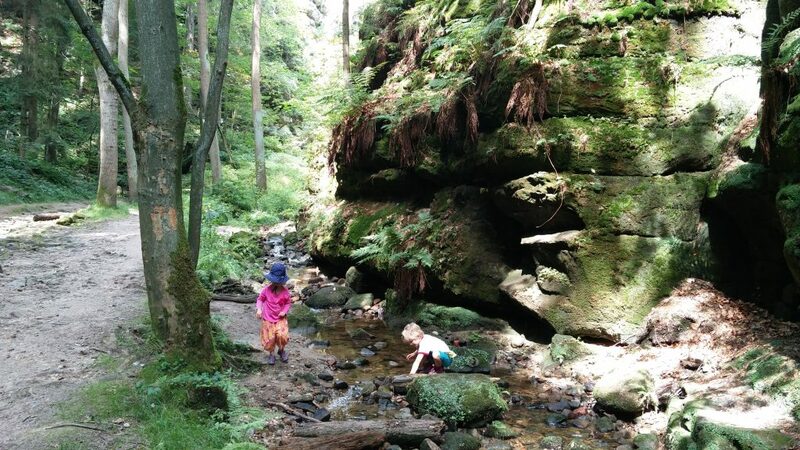 We knew we needed to make progress so we decided to forge on the next day, only to have an odd day of trying to visit Bastei and failing to get close enough for the kids to walk. In the end we found a lovely walk down to a crazily remote little restaurant in a gorge that we found almost by accident. This is what it’s about! 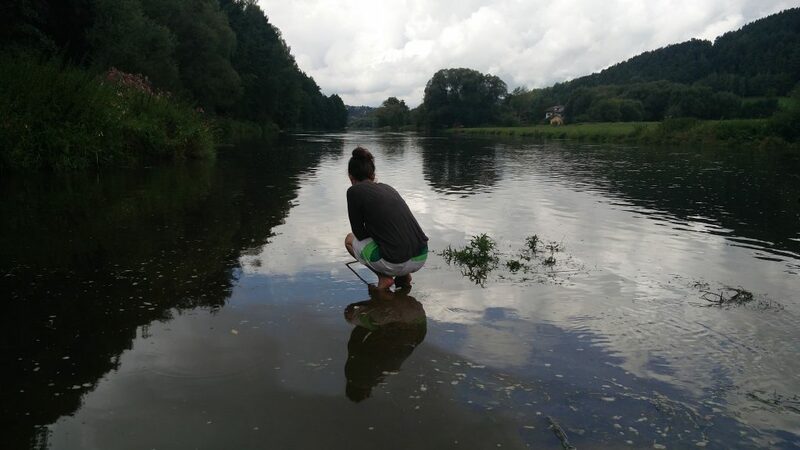 That evening we tried to find a cheap camp around a pretty town called Bad Schandau but failed, and then had our first “Sorry we’re full” experience. In the end we found a place that squeezed us onto their tent section and actually had decent wifi (campsite wifi is almost always crap) so we could sort out our plans. We’d always intended on heading down to Austria straight after Germany and checking out the lakes before we met friends in the black forest, but, we we’re starting to come to terms with the distances we could cover and still enjoy ourselves. 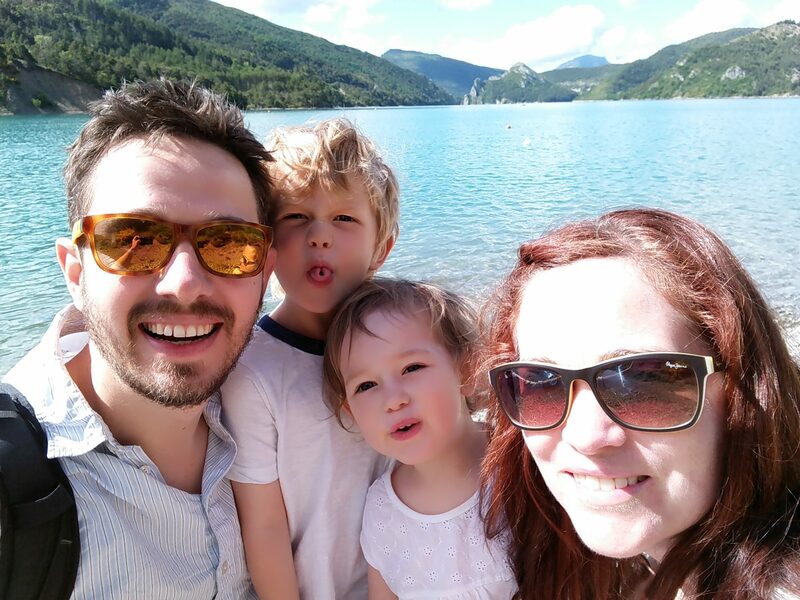 We worked out that the Austria plan was stressing us out because we were trying to squeeze two weeks of travelling into a week, which would have just been flogging ourselves and keeping the kids in their seats more than we wanted. We always said we’d rather see less but enjoy it on this trip and this was the first real time we had to change plans to enact that. Work our way more directly to the black forest and head to Austria on the way to Italy rather than go out as far as Slovenia and Croatia. All of a sudden we felt happier, the distances were realistic! This meant we could drop into Prague and also check out Bavaria on the way through. The next morning we headed off for a couple of hours drive to get to Prague. We felt like we were missing out on Saxony but it had been an unexpected stop that was beautiful and again we felt like we were leaving without really exploring. We chalked it up as yet another place that would stand a couple of weeks holiday at a later date. The trip to Prague was nice and easy, the border crossing into the Czech Republic was a little odd as the road suddenly got worse and there were lots of rough looking tourist shops selling mostly wooden windmills..errr…ok??? It really made us laugh and then a whole class full of children on a trip started randomly waving at us. We weren’t used to border crossings being anything more than signs, but then we got on the motorway and all was ok and boring again!! 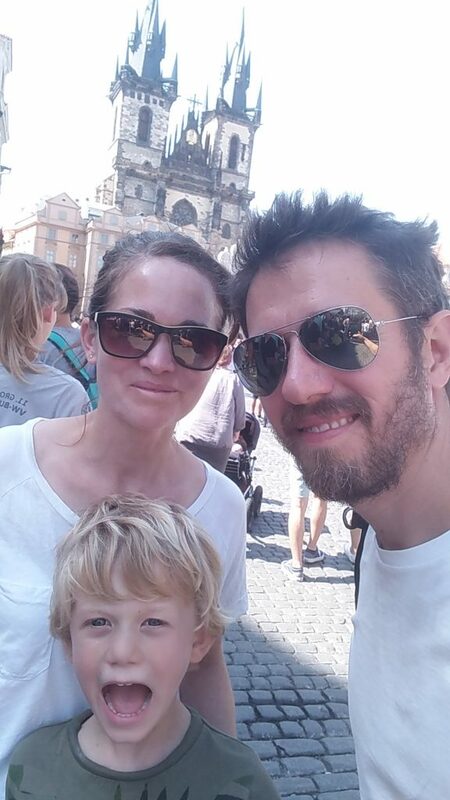 Prague was lovely, after an initial false start where we got thrown off a campsite. We arrived at a place we’d picked from googly maps which turned out to be someones garden. After flawlessly manoeuvring the beast down a steep drive and into a spot only about a foot bigger than the van Anna cried too loud for the owner. “Just leave….she is crazy!”…or maybe she’s just three? For the best…didn’t want to stay there anyway ;O). 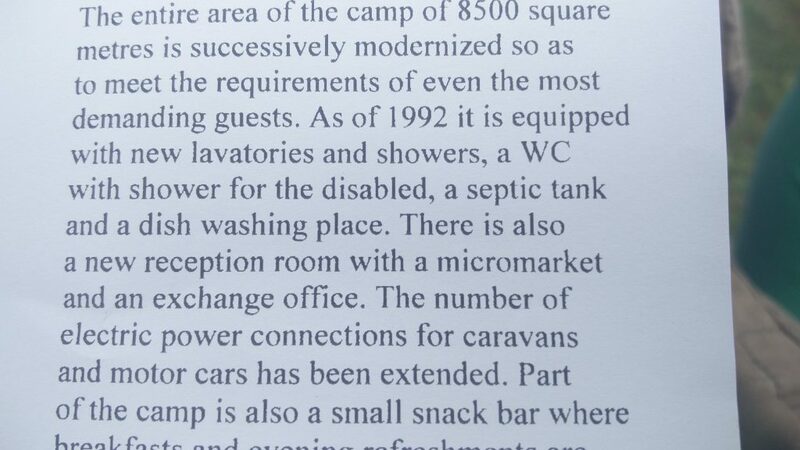 We then found a place just north of the city which was much less uptight and had the amazing boast of having “up to date sanitary facilities” renovated in just 1992!! They had the feeling of a south american prison…but the rest was nice and relaxing. 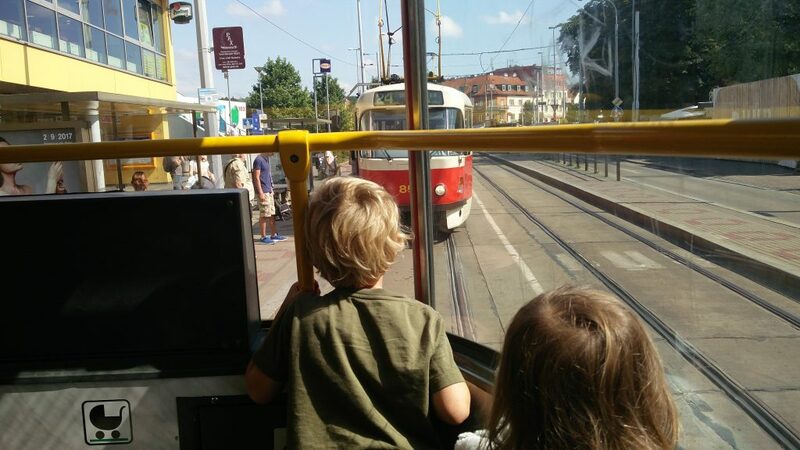 We had a nice bus and tram ride into the city, a poke about town and….ICE CREAM. We also found an amazing buffet style veggie restaurant for lunch that was full of locals where we piled our plates high to offset the slightly bread heavy diet we’ve had of late. After our brief Prague stop we hightailed back to Germany to try and give ourselves a break in Bavaria to relax as we’d moved a lot since Berlin. The journey was an boring rainy motorway run but in a couple of hours we were back in Germany and holed up at one of quite a few free village stops where you can park for free overnight and have all the right drains and taps that you need for the van. We’d plumped for Pleystein which was a sleepy village close to the border with lots of cycling routes and the predictably pretty church. We had a wander around and then went for pizza in a place that I can only assume is setup for takeaway as when we went to sit down it felt like the tables had been laid in the 70s. 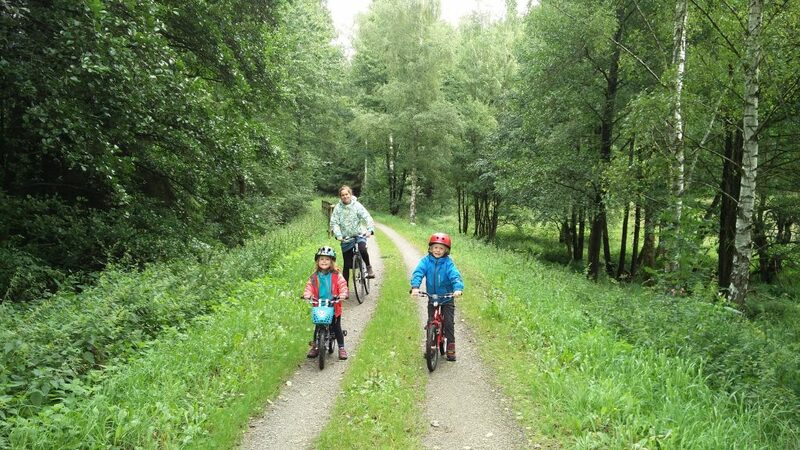 The next morning we had a ride out on the bikes along an old railway line route with all four of us riding…go Anna! A lovely bike route from a random free stop, this is what is lovely, finding things unplanned because we have time to explore. 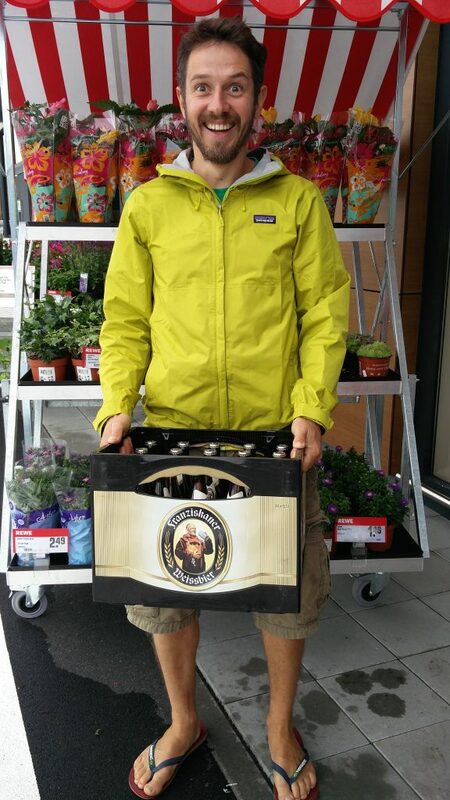 Crates of nice beer in the supermarket…i’m a simple but happy man. Pleystein had been a quick stop on our way to our main Bavaria event, Adventure Camp Schnitzmühle. 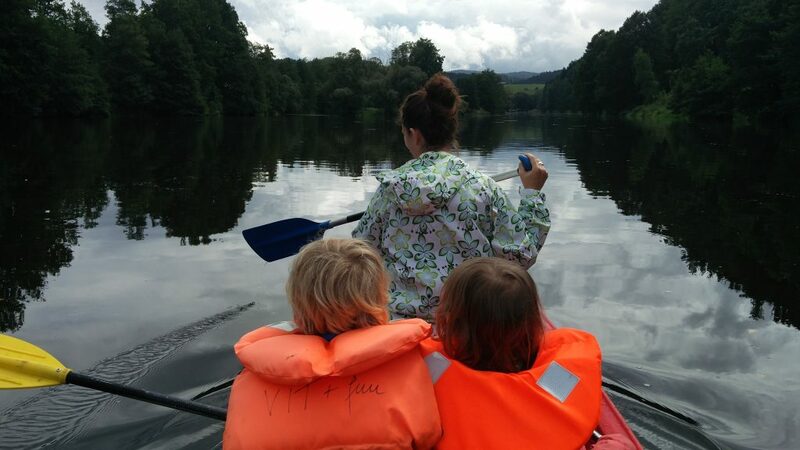 In the middle of the Bavarian forest the often mispronounced (hilariously…by Jayne) Schnitzmühle was right down in a valley on a little island attached to a cool hotel. This place was awesome, the river, a swimming lake, firepits and fires allowed, and we managed to bag a pitch right by the river. We ended up staying five nights and we could easily of stayed more. There wasn’t a great deal immediately nearby but that wasn’t really a problem as the hotel had a lovely restaurant and there was a train stop right next to the campsite if you wanted to explore the rest of the area. 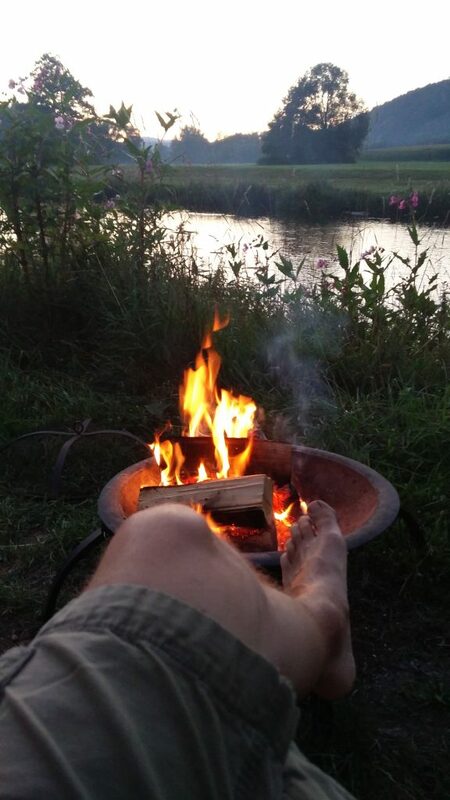 We spent our time playing in and floating down the river, canoeing, having fires, and generally just chilling out. It was the first time we’d had a relaxing stop since Rugen and we’d needed it. 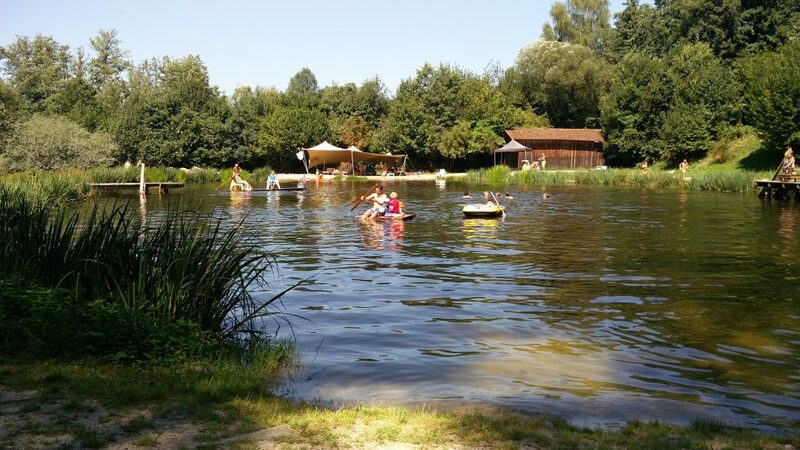 Taking to a raft on the swimming lake. FisherJayne : The only person to catch something with the fishing nets. 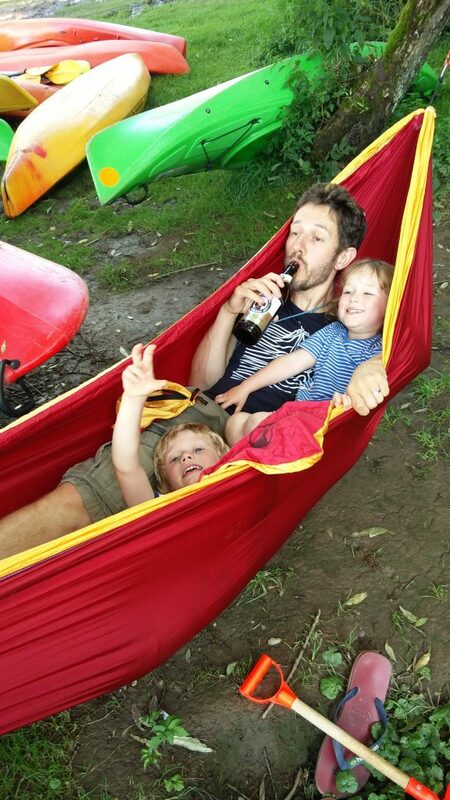 I bought a double hammock in Prague…I was not disappointed! 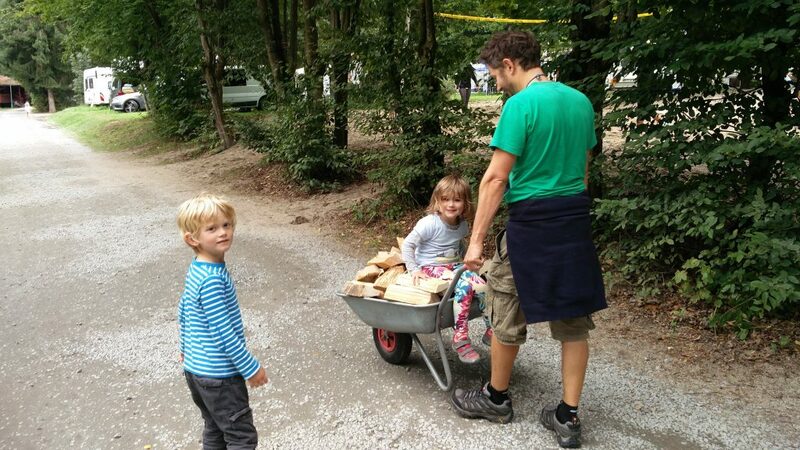 After five nights we headed off happy and relaxed to traverse south Germany and meet the Robinsons! Anna’s cycling is awesome. Go Anna.